It looks as if we are finally rid of Chip Caray calling games at TBS. Absolutely horrible. It’s not often I call for someone’s head, but this was a long time coming as he just didn’t seem to have a grasp on the game of baseball. Now if we could only find a way to get baseball off TBS we’d really be in business. Two new names that have started popping up in trade rumors are that of outfielder Josh Willingham of the Nationals and pitcher Kevin Millwood of the Rangers. Both for different reasons. First you have Willingham, a talented 30-year old outfielder who never gets any national attention due to the fact that the only two teams he has ever played for are the Marlins and Nationals. But despite playing for the hapless Nationals last season, Willingham put up a .260/.367/.496 line with 24 homers and 61 RBI while constantly playing hard on every play. This is just the type of player that the Seattle Mariners, San Francisco Giants and Atlanta Braves are in the market for. The only question now is whether or not the Nationals are interested in moving him. On the other hand, the cash-strapped Rangers look to be freeing up some money this off season by possibly moving their ace Kevin Millwood. Millwood had a strong season posting a 13-10 record, 3.67 ERA and 123 strikeouts last season. Thoughts are the Rangers would like to give themselves a little extra money to try to bring in free agent starting pitcher John Lackey to head up their rotation. One team believed to have inquired about the veteran righty was the Milwaukee Brewers who themselves are looking to bolster their rotation. At this point these rumors are in early stages so it will be interesting to see if anything develops. On the complete opposite side of the spectrum from my article earlier today regarding the Chicago Cubs bleak financial picture this off season, the Seattle Mariners have been able to unload about half their salary from a year ago. With Adrian Beltre, Miguel Batista, Jarrod Washburn, Kenji Johjima and Erik Bedard amongst the players that will finally be leaving town and/or coming off the books, the Mariners $98 million payroll will be given an almost $50 million cushion this winter. This gives the Mariners tons of flexibility to bring on players that can truly help them compete with the Angels in 2010 which is something they have been hoping to do for years. 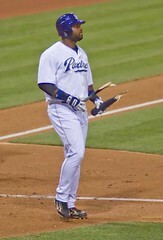 The Mariners can now work on resigning their slugger Russell Branyon to anchor first base again this year as well as pursue other options like Orlando Hudson at second base and former Angel John Lackey to sure up the rotation and Chone Figgins to take Beltre’s spot at third. It has been a long time since the M’s had an opportunity to really do things to help their team and I think the fans up in Seattle couldn’t be more excited for the winter ahead. Bradley's temper has always been an issue (SD Dirk/Flickr). It appears as if the Chicago Cubs are financially handcuffed until they find a team to take outfielder Milton Bradley and his cumbersome multi-year contract off their hands. The Cubs would love to bring in a free agent centerfielder to run around Wrigley next season but are unable to unless they can get the noose that is the 2-year, $20 million contract off from around their neck. 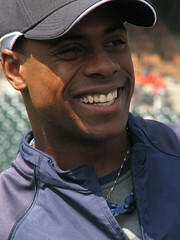 Chicago has a few players on their radar including free agents Coco Crisp, Scott Podsednik, Rick Ankiel, Marlon Byrd and Mike Cameron as well as their main target via trade in Detroit Tiger Curtis Granderson. There unfortunately aren’t too many suitors that would be willing to take on Bradley along with this difficult contract and obnoxious attitude. One such team that may be able to make something work would be the New York Mets who themselves have been trying to unload Luis Castillo for a few years. This may be their only hope as not too many teams are willing to take that leap of faith anymore with Bradley. If they can get a deal done to get Bradley out of town, they will pursue these players hard in order to fill a gaping hole in center. Is Ben Sheets Worth The Risk? It feels as if I was writing this exact same article around this time last year. Oh wait, that’s right, I was. Although the situation is very similar, last season’s setback that made Ben Sheets miss the entire season will undoubtedly be in the back of many team’s minds when they consider whether or not to sign the former stud pitcher. I have always been a fan of Sheets and was very vocal in my stance that teams should give him a chance to prove himself last season in some sort of incentive laden deal. While I admit I was wrong in my stance (thanks to the injury), I am back on the same boat this season and think that teams should give him a chance. And to back up my view, here is a look at what Sheets has done as well as my scouting report on him before the injury. Now let’s hope he proves me right this time. Scouting Report: Johnson has established himself as a rising ace for the Marlins. 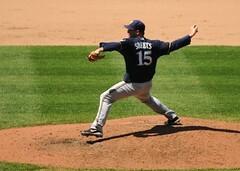 He is a tall power pitcher who is very imposing on the mound with his 6-7 frame. He has a very smooth, sound delivery and takes advantage of his stature by producing a fantastic downhill angle to the plate which gives the appearance that the pitch is coming down on the hitter. His pitch arsenal includes both a two and four-seam fastball (sitting between 92-96 mph) which is lively both up and down in the strike zone. Johnson does a great job pitching inside on hitters which helps open up the strike zone for him where many pitchers are affraid to go. His secondary (strikeout) pitch is a power slider that he is able to change the break on depending on if he is facing a lefty or a righty and keeps hitters honest. Also adds a decent changeup as a third pitch. Johnson has completely recovered from his Tommy John surgery he had a few years ago and established himself as a legitimate star on the mound. The only question now remains how good can he become and what uniform will he be wearing as he realizes his greatness. You are currently browsing the The Diamond Cutter blog archives for November, 2009.